We believe everything is best in moderation…including moderation. But for anyone trying to shed pounds, figuring out which foods are truly healthy—and which ones are just imposters—can be difficult. 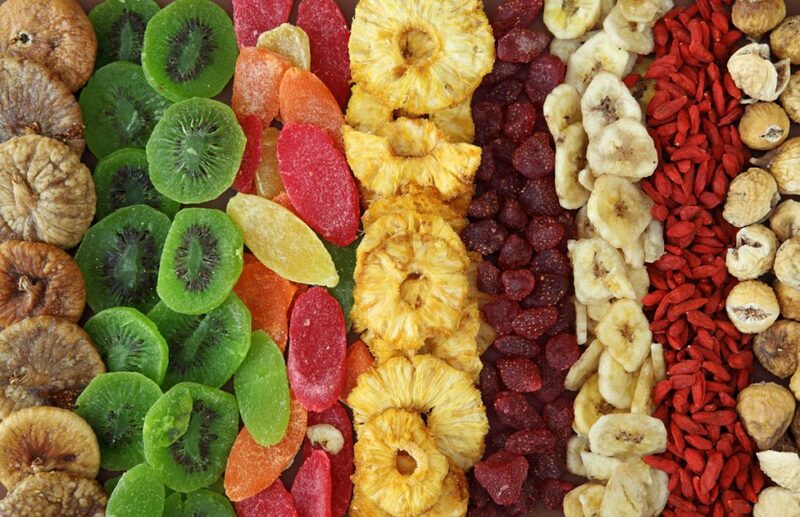 This trail mix staple may seem like a great alternative to candy, but dried fruit is positively packed with sugar. That’s because the dehydration process can nearly triple the sugar content of fresh fruit by volume, depending on the variety. For example, the nutritional information of a popular brand of dried cranberries shows that 1/4c of this treat has no fat, few calories, and a whopping 33g of carbohydrates, 29 of which are sugar. To put that in perspective, one cup of raw cranberries only has 4g of sugar—and a full Snickers bar has 20g of sugar! The verdict: Considering the recommended daily intake of sugar for adult women is 25 grams, it’s probably best to skip this snack and pick up your favorite fresh fruit instead. If you can’t resist the chewy goodness of dried fruit, just keep an eye on how much you’re eating at a time and how often you’re indulging. Crunchy, salty chips that are actually good for you?! Yes please! Unfortunately, most commercially available varieties aren’t any better for you than their potato counterparts, which are typically chock-full of carbs, salt, and saturated fats. The unhealthy aspect usually comes from the oil they’re cooked in and the salt used to season. To top it off, many veggie chips still include potato flour or other simple starches, making these “healthy” snacks more akin to any old potato chip than a vegetable. The verdict: Overindulging in a bag of beet or carrot chips may be as bad for your diet as having a “snaccident” with a can of Pringles or bag of Lays. Whatever crunchy treat you choose, check nutrition info thoroughly and remember they are most often a treat to enjoy in moderation. Or, even better, eat crisp, raw carrots with an added sprinkle of your favorite natural low-salt seasoning when crunch and salt cravings strike. As grocery stores make more effort to include a variety of products suited to folks following a restricted diet, vegans, the gluten-intolerant, and those with certain health conditions rejoiced. Specialty products are fantastic for those who have made a lifestyle change or are sensitive to certain ingredients, but just because a snack doesn’t have wheat, animal products, or dairy doesn’t mean it’s a “health food”—especially if you are not on a restricted diet yourself. Vegan sweets and baked goods are great alternatives to other dishes typically rich in dairy and eggs if you are allergic to milk or eschewing animal products. However, to compensate, they often contain high amounts of sugar and plant-based margarine that are just as calorie-dense as their animal-product counterparts, sometimes making their nutrition profile even worse than standard versions. Unless you choose unsweetened varieties, many dairy-free “milks” have higher sugar content to mimic the natural sweetness of lactose. Check for grams of sugar on the label to be sure—zero grams, such as you’d find in unsweetened almond milk, is best. If you don’t have celiac disease or a non-celiac gluten sensitivity, pre-packaged gluten-free foods aren’t always a better choice—and they certainly don’t guarantee weight loss. Replacing gluten with alternative starch, fats, or sweets (common in commercially prepared gluten-free snacks) can actually lead to weight gain. The verdict: Specialty products do not equal healthy products, so be sure to watch labels and make sure you aren’t working against your weight loss goals. This one may come as a surprise, as we’ve spent decades hearing that we should drink lower fat milk, avoid butter and eggs, and that all fat is bad. But did you know that most of these ideas have been challenged by studies in recent years? In fact, modern research has shown that eating healthy fats—such as vegetable oils, fish, and nuts—is actually necessary and beneficial for your overall health. While low fat milk or other dairy products do have fewer calories, remember that calories aren’t everything! The lack of fat means you’re missing out on beneficial fat-soluble vitamins, which is why nutritionists now recommend whole milk products over those with less fat, even for weight loss patients. Just use them in moderation and favor dairy products that help you feel full, such as plain yogurt, versus grabbing a glass of milk when you could quench your thirst with water instead. If you’re trying to eat healthy, grabbing a smoothie or fresh juice on your way to work may seem like a good choice. But once again, sugar—the culprit behind rapid increases in diabetes and other conditions—may be making your supposedly healthy drink a no-no. To make fruit and veggie-filled smoothies and juices tasty (and addicting! ), many companies take the cheaper shortcut of adding sugar or apple juice, which is high in fructose, rather than experimenting with different combos of flavors. Additionally, some favor very sugary fruits rather than taking a balanced approach. Lastly, drinking your calories rather than chewing them might mean you feel less full after consuming the very same amount. This is especially true of strained juices where the beneficial fiber has been removed. The verdict: If you can’t start your morning without a smoothie, try making them at home where you have more control over ingredients—and keep the proportion of green additions such as kale, avocado, and cucumber high, while limiting sweet fruits. If you’re pinched for time or traveling, look for smoothie blends that have plenty of fiber, nutrients, and low-to-zero grams of sugar (and no added sugar). Ultimately, the best weight loss solution is figuring out what works for you and your body—which is something you may not be able to tackle alone. Whether you bring up your concerns to your primary care physician, schedule a meeting with a nutritionist, or consider weight loss surgery, sometimes a little expert help goes a long way.